Dr. Morris Cerullo, Apostle and Prophet of the Lord Jesus Christ, is a man on the move for God. He is a man whose entire life is dedicated to fulfilling the call of God to take the Gospel of Jesus Christ to every living creature. In 1962, God gave him a specific call in Porto Alegre, Brazil when He said, “Son, build Me an army.” This army is made up of Nationals trained to take the Gospel to their villages, cities, states, and nations with the same anointing that rests upon Dr. Cerullo’s life and ministry. God has used Dr. Cerullo to pioneer overseas ministries and open many countries that have been considered closed to the Gospel. His ministry is accompanied by a manifestation of God’s miracle power. 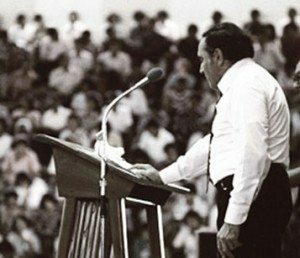 In his early years of ministry throughout Latin America, he faced tremendous opposition. He was arrested and detained many times for preaching the Gospel and praying for the sick. In 1965, when Dr. Cerullo first went to Argentina, the country was almost completely closed to the Gospel. Due to the fusion of church and state, every time there was an attempt to conduct an evangelistic campaign there was tremendous opposition, often resulting in persecution. During a crusade in 1965 in Mar Del Plata, Argentina, there were so many miracles of healing the College of Doctors issued a complaint accusing Dr. Cerullo of practicing medicine without a license and ordered his arrest. Despite the fact a warrant was issued for his arrest, he continued to minister nightly under a heavy anointing with hundreds of people being saved and healed. The police met him at his hotel, arrested him and took him to jail. After intensive interrogation, he was released in time to conduct the last night of the crusade. The impact of these early crusades spread across Argentina and was the turning point in evangelization, not only in Mar Del Plata and Rosario but also in the cities and villages throughout the entire nation. Many of the ministers that attended those crusades and were trained in the Schools of Ministry in Buenos Aires in 1969 and Rosario in 1972, had their lives changed as they saw, for the first time, a powerful demonstration of the supernatural power of God. Today many of them have large churches and ministries that are impacting their nations for Christ. The same is true for Indonesia, Malaysia, Israel and the entire Middle East, the Far East, Africa,Mexico, Central and South America and virtually every nation on Earth.